Following Tuesday’s wide spread up bar which signalled the long awaited break out from the sideways trading of the last few weeks, and providing us with a bullish signal, yesterday’s candle came as bit of surprise, finishing the day as a bearish harami (Japanese for pregnant) candle. As I suggested in yesterday’s commentary we should now see a bull move in the medium term and this has now been confirmed in early trading this morning which could see a break above 100 as the day unfolds, and if so then this will negate the harami signal of yesterday. The harami is one of the less reliable charting signals, and in an upward move is often a seen as confirmation of a continuation in the trend, so whilst we need to pay attention, it is certainly not a stron signal by itself. With all the moving averages now pointing to a move higher my suggestion for trading is the same as for yesterday and to look for long positions and use the shorter time frames for your entry and exit points. 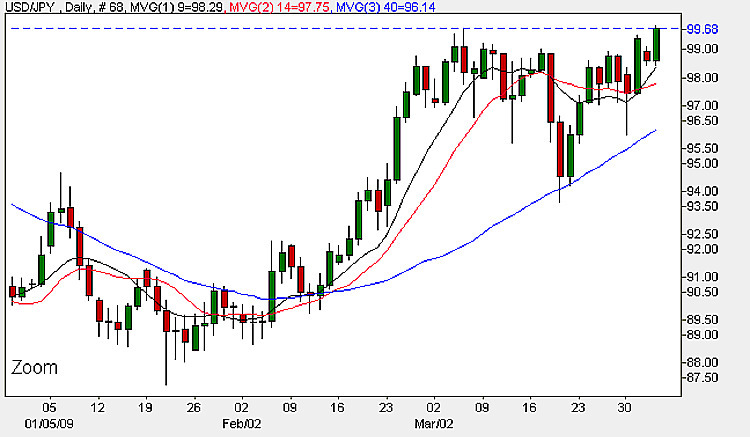 Any stop loss position should be below the 95.60 region or below. With all the fundamental news on the economic calendar relating to the yen to dollar pair restricted to the US we still could see volatility enter as a result of the G20 summit as markets await the final communique. Don’t forget you can keep up to date with all the latest currency news, fundamental news and live currency charts by simply following the appropriate links. Details are also provided on a good ECN broker.